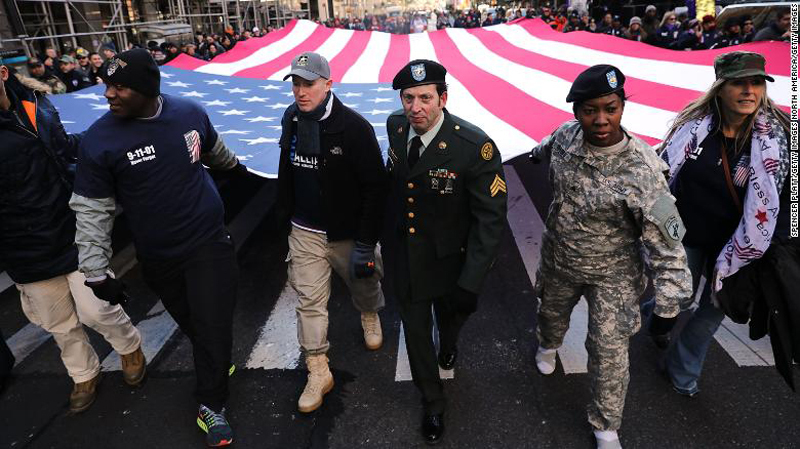 Soldiers, veterans and civilians carry an American Flag as they march in the Veterans Day Parade on November 11, 2017 in New York City. Every year on November 11, Americans honor the 19.6 million active and former US service members who have gone to war. Veterans Day is marked by parades, speeches and solemn ceremonies offering a nation's appreciation. Operation Gratitude has sent more than 2 million individually addressed care package to the military community. The packages go to current military members as well as veterans, wounded warriors and their caregivers. As more American troops return to civilian life, the Operation Gratitude veterans program has been growing. It also has a letter writing campaign encouraging everyone to write handwritten letters of gratitude to veterans. If you know a veteran who might be dealing with PTSD, you can connect them with helpful resources. The VA offers the PTSD Coach Online to help veterans learn to manage symptoms, come up with ways to cope and find professional help. The National Center for PTSD provides a Veterans Crisis Line by phone at 1-800-8255, by text at 838255 and by online chat at this link: Confidential Veterans Chat.